I’m back with another technique in rainbow card making to share with you. For this card, I used stamps to create a rainbow effect on the cupcakes. If you look carefully at the icing on the cupcakes you’ll notice that there is a gradient of colors to each one. The first has reds and oranges, the second has orange and yellow, the third has yellow and green, and the last one has blue and purple. The stamps were first pressed into the lighter shade and rolled into the darker shade to create a seamless blending. To emphasize the coloring even further I added a hue of shading to the cupcake liner and put sequins on the bottom that coordinates with the coloring of the icing for the individual cupcake. To ground the whole image (so it doesn’t look like the cupcakes are floating in the air) I added some gray shading to the bottom of the card. 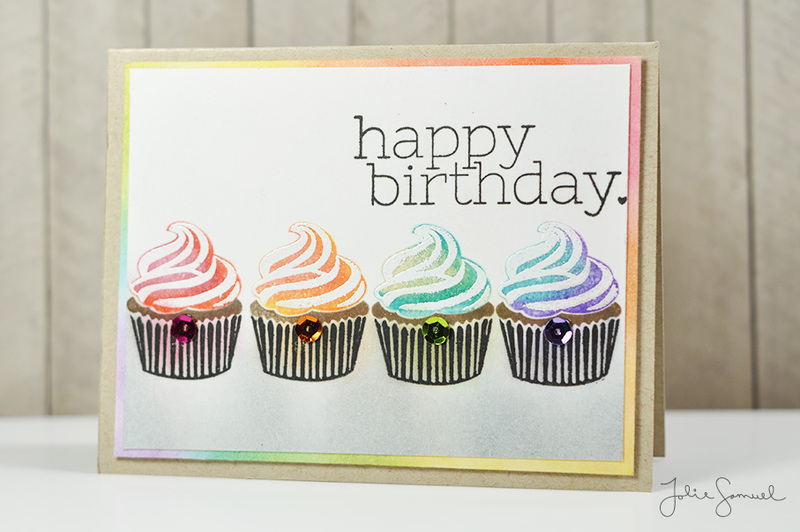 I also added some white frosting embellishments by embossing a layered stamp onto the rainbow inking – it really brings that frosting image to a whole new level. I wish you could see it in person. To finish off the card I added what I felt was the most suiting sentiment – ‘happy birthday’! I mean who wouldn’t want one of these cupcakes for their birthday?